The Natural Resources Conservation Service (NRCS) is extending the application deadline to July 31 for landowners in the western two-thirds of Nebraska who wish to apply for funds to control invasive plants. “This has been a short notice sign-up and the applications are coming in. However, we project funding will still be available, and we want to give landowners more time to apply,” said Steve Chick, NRCS State Conservationist. Landowners in the North and South Platte River basin, the Platte River basin to the eastern Polk County line, all of the Republican River basins and the Niobrara River basin are eligible. 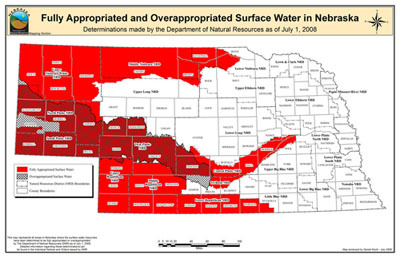 These basins have been declared fully or over appropriated for surface and/or groundwater. Funding is available through a new option in the 2008 Farm Bill, called the Cooperative Conservation Partnership Initiative. Nebraska could received $1.5 million in federal funds is available. Area or county weed management offices may have additional funding. Landowners also may be responsible for a portion of the cost. The cost-share assistance is targeted to landowners who recently had riparian corridors sprayed for invasive weed control, or soon will have such work completed. For more information about CCPI, contact any NRCS office or County Weed Commissioner. Information is also available on the NRCS Web site at www.ne.nrcs.usda.gov, and the Nebraska Department of Agriculture Web site at www.agr.ne.gov.